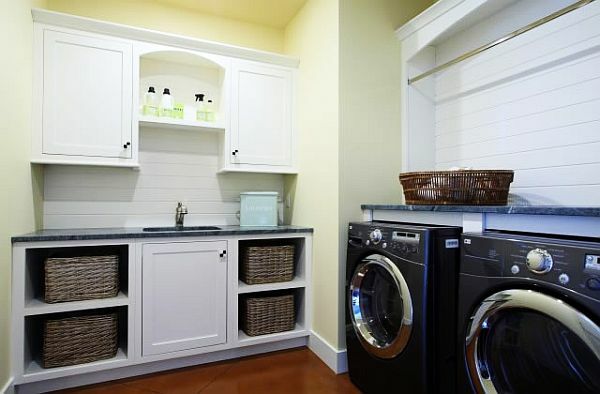 A laundry room doesn’t have to be that dull, boring place where you only go to throw dirty socks and t-shirts. You don’t need to be afraid of it. 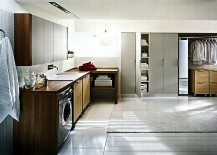 It needs to be comfortable, cool and pleasant and at the same time, highly functional. 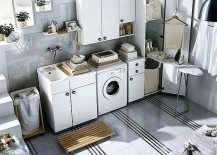 So if you’re looking for design ideas to decorate the perfect laundry room, the list below should be of great help. 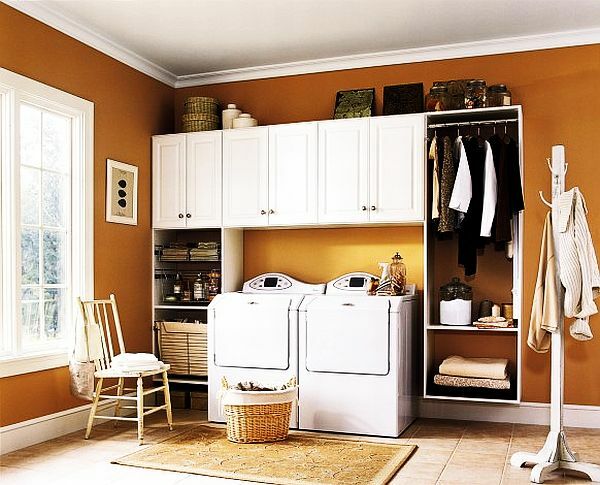 If a laundry room is too small, you’ll have to make it look larger. It’s the same with all your other areas. 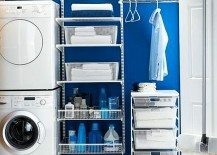 So how about stacking the dryer on top of the washer (you’ll have to make sure your wash has front-loading for that to work) and save some space for a narrow cabinet to store your stuff? 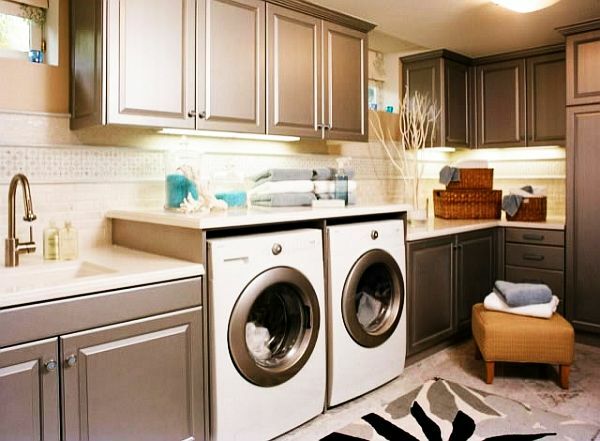 One last thing to consider is if you have enough light in your laundry room. 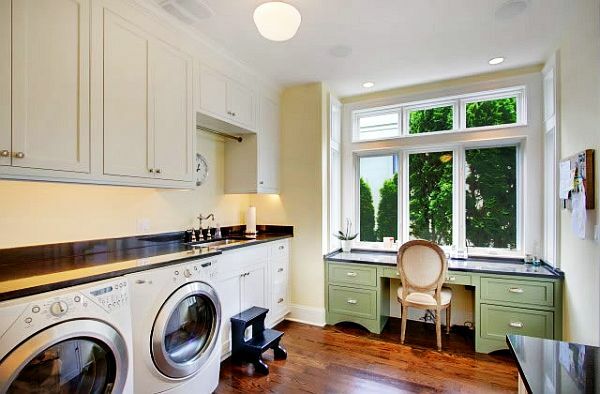 It’s preferably that you have at least one window for natural lighting. If that’s not enough you should consider installing under cabinet lighting. 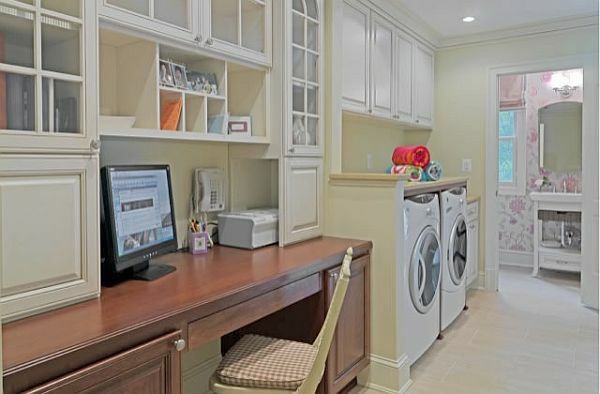 A small chair to reach the upper cabinets, stylish countertops, matching flooring and a desk office facing the yard. 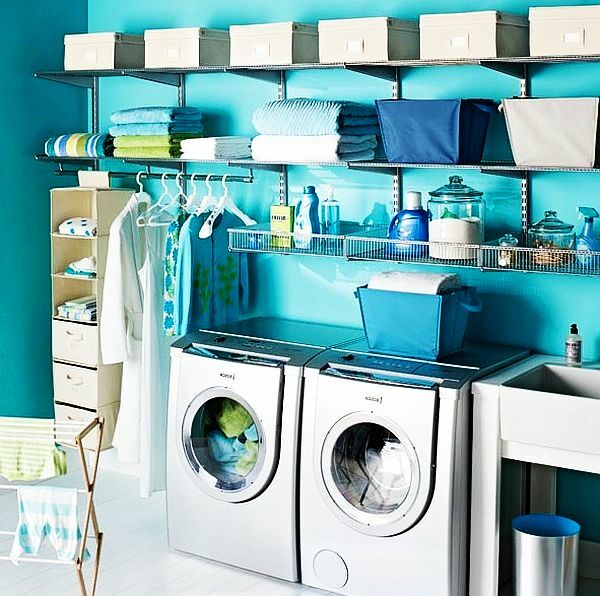 Not sure about you folks, but it looks like a dream room — if a laundry room can be one. Classic meets modern. 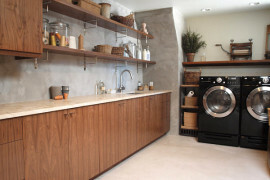 There’s plenty of counter space, cupboard space, and the washing machine setup is sleek. 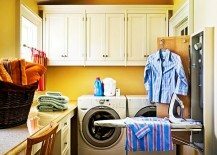 The only think you should worry about is if your mom will ever come out of the laundry room again. Just make sure there’s no TV. 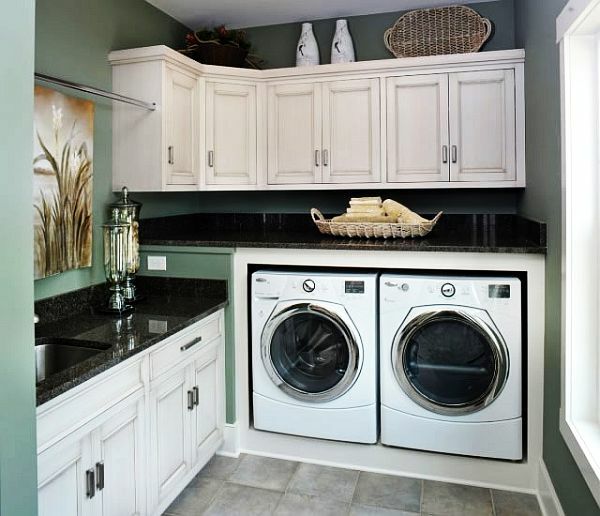 A great example of a laundry room done right. 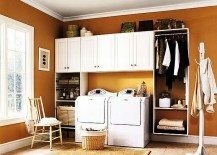 With plenty of cabinets and plenty of storage space, this setup gets the eye for breathing stylish from every little corner. 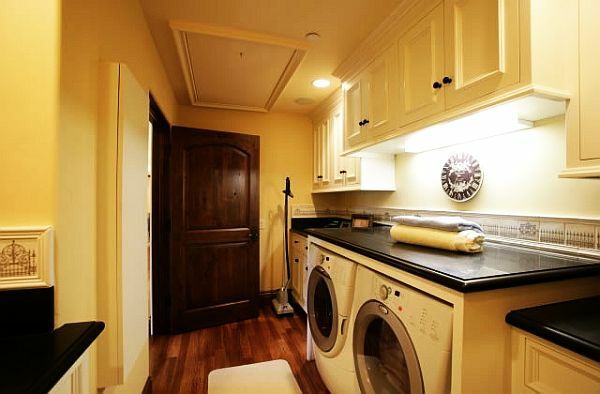 Totally appreciate the elevated washer and dryer so that you don’t have to bend over too much. Love the bright light (thanks to the window) and the orderliness. 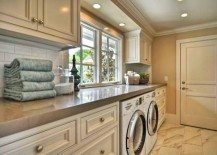 Some of you will call this their favorite laundry room, some would be amazed by the cabinets; “what type of finish or metallic paint is it?”. 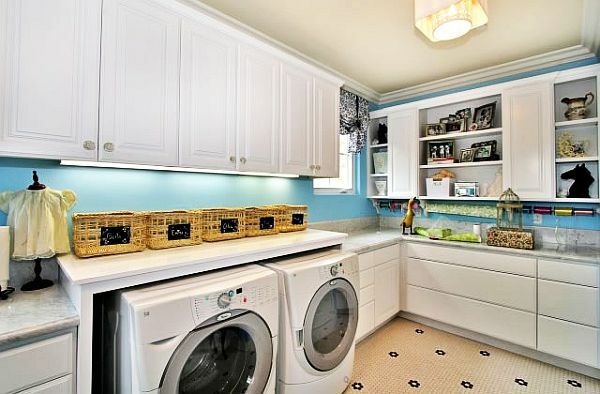 The sink is close to the dryer and the washer, and there are two different levels of counter space. On top of that, the different counter heights and the lights under cabinets add to the overall stylish feel of this basement laundry room. 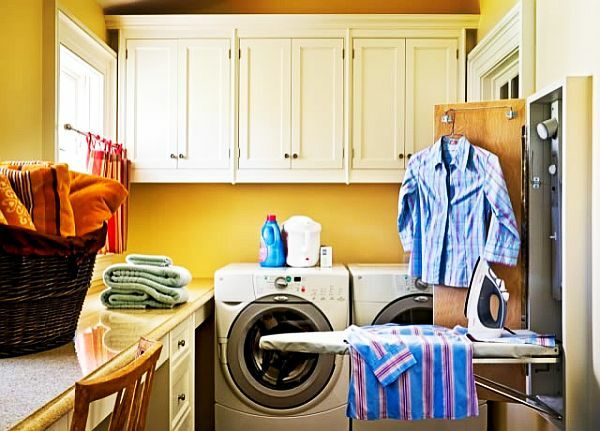 Good lighting is key to keeping away from a messy room. 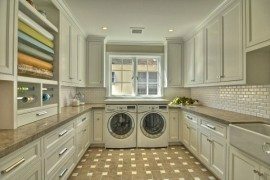 This one has plenty of it, and on top of that it’s been outfitted with personalized features that accommodate any size family. 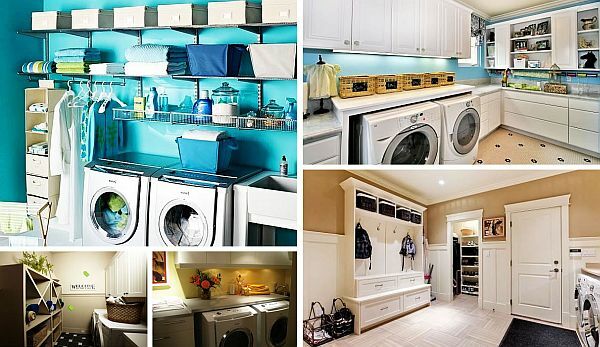 Also, there are cabinets, shelves and baskets to keep everything within reach. 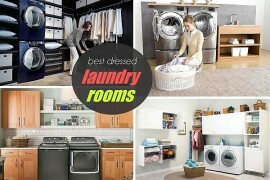 The next two designs you’ll see are all about cleanliness and being well organized. 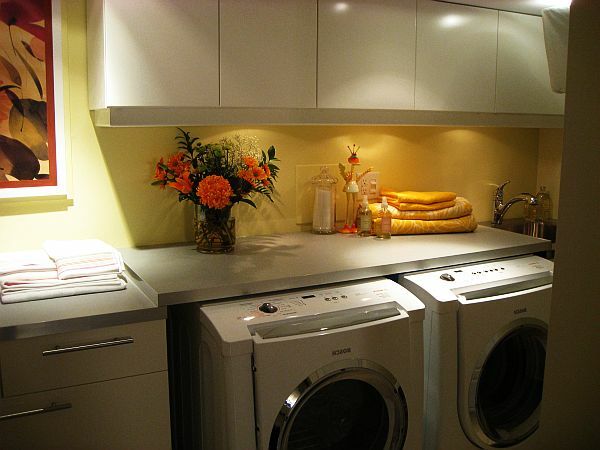 There’s plenty of storage space in those cabinets and a minimalist feel — if you can call it that way. 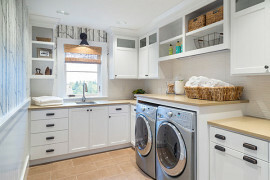 Shane Inman is the guy behind this custom-designed laundry room that features granite countertops, an undermount sink and sweet cabinetry design for endless storage. 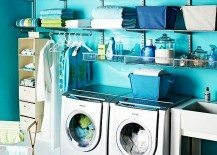 When you have too much space to organize a laundry room it can be problematic. Use this as inspiration and it won’t. 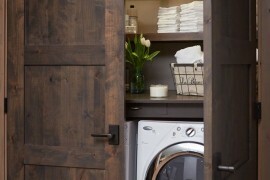 Totally in love with the wooden cabinets, the closets and the hanging bar for the clean stuff. And when we said too much space, we never meant this. Because really, who has that much space to store pillows, one by one. That’s probably one of the most expensive setups so far, but at least it’s inspirational. 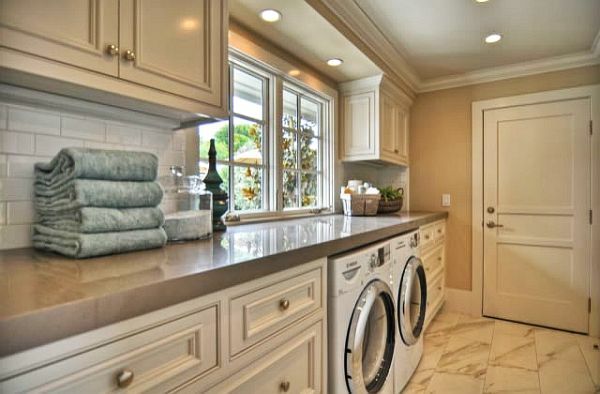 Why is there an island inside of this contemporary laundry room? 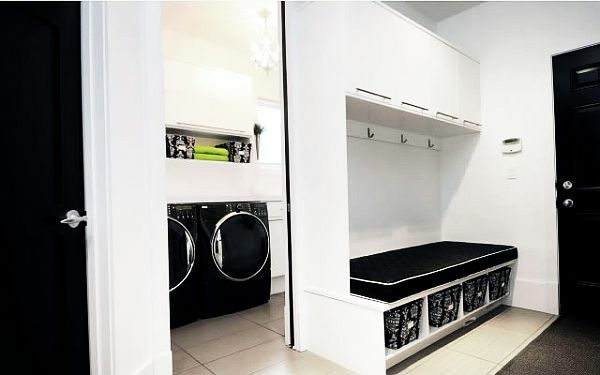 For folding your stuff when you get it out of your washer. 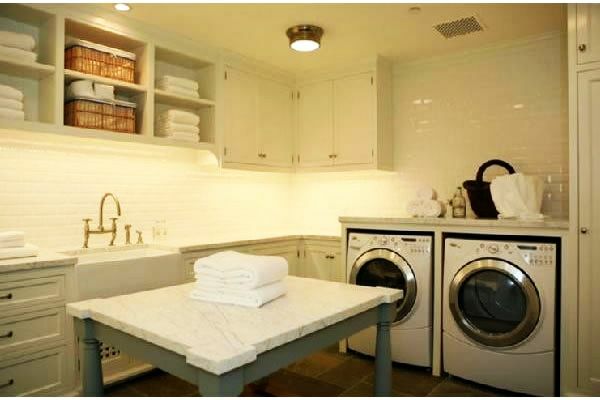 Just so you know, the sleek countertops are Carrara marble. Perfect, right? I think we gave you enough words about this one. 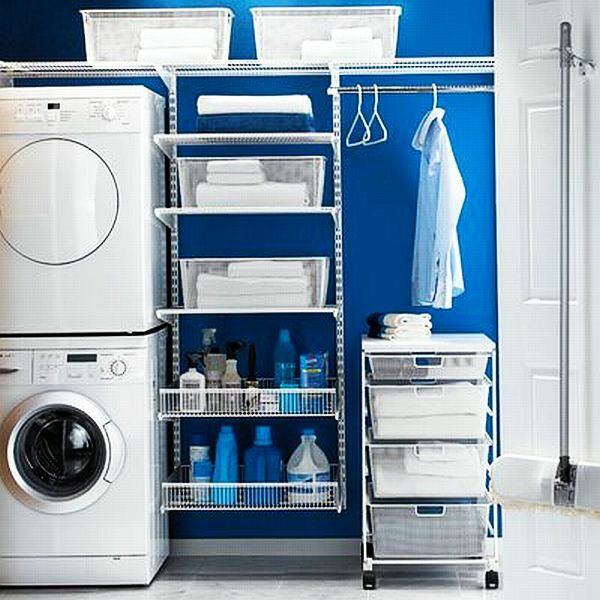 It’s all about storage. You can never have too much storage, right? 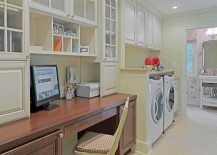 Laundry room in the home office? 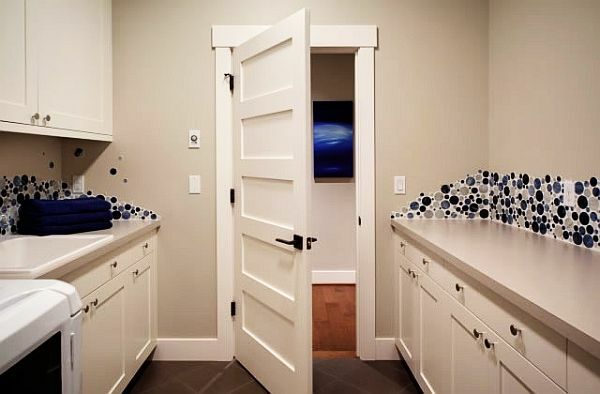 Great design idea! 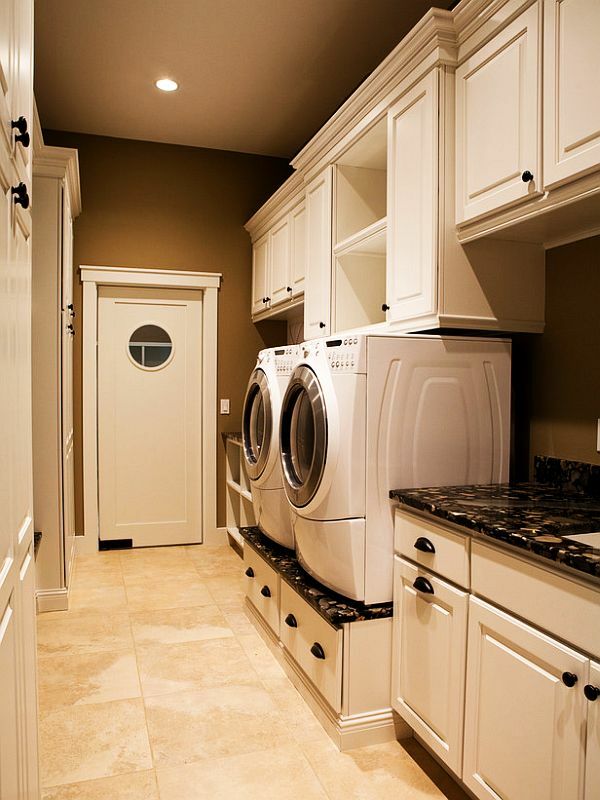 Absolutely gorgeous cabinets doing well against the white dryer and washer, with plenty of shelves for storage. 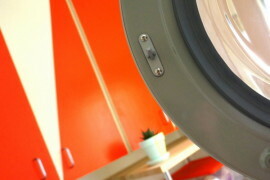 But the cherry on the cake here is given by the orange accents on the grey-inspired furniture. What have we here folks? 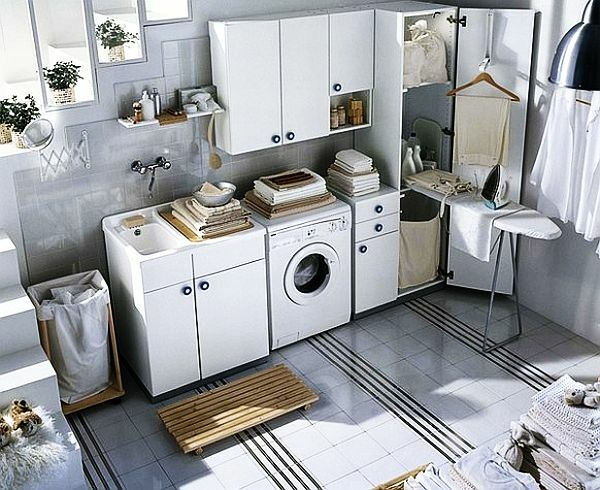 A stunning laundry room that is extremely well organized with ClosetMaid MasterSuite in white. I totally dig the open drawers and the elegant flooring. 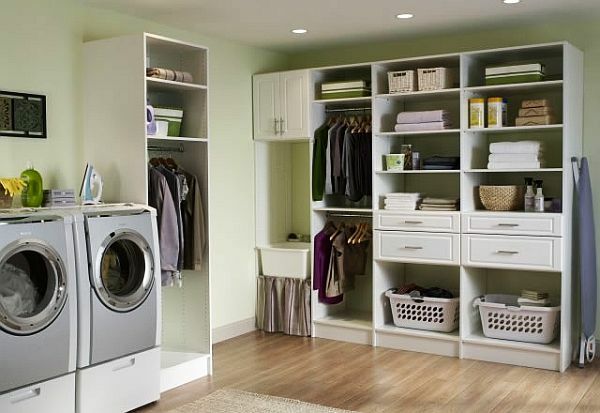 Definitely a good idea having a coat/shoe closet in your laundry room. The cabinets up there, look delicious as well. 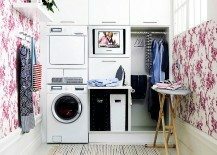 A laundry room made simple. 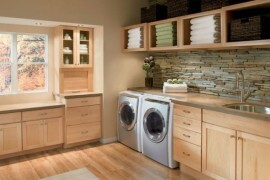 We fancy the shelf above the washer and dryer for folding, the light under cabinets and the raised counter over washer. Sleek! 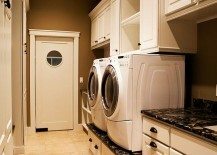 by Atmosphere Interior Design Inc.
One of the reasons why you cover up your basement doors is to suggest the feeling of an above-ground room. 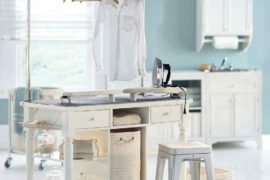 It seems that all furniture pieces balance out the room’s sweet look. Sold! 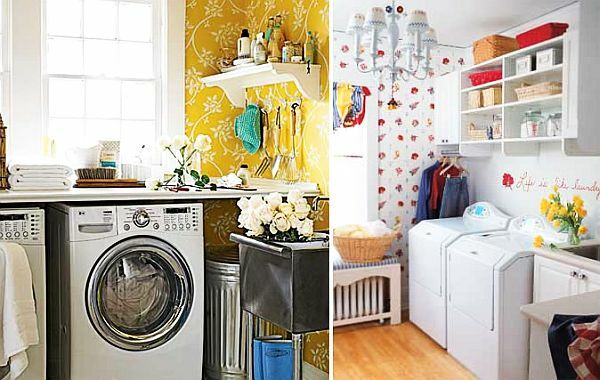 You’re either a Hello Kitty fan and your parents allowed you to decorate one room of the house (that will stay shut when not doing laundry), or you’ve been a pink lover your whole life and everything you’d do to your home involves the color. 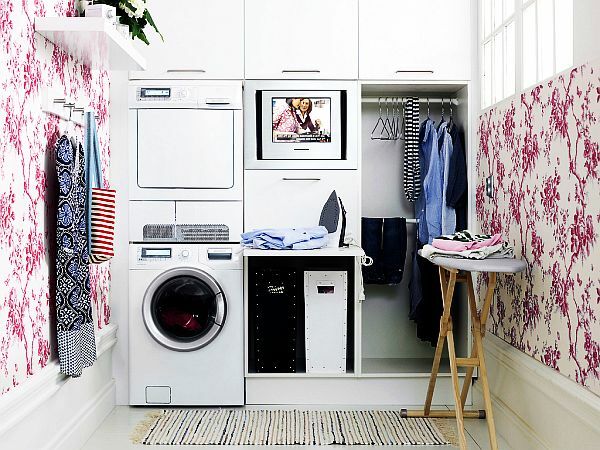 We’re not yet sure why you’d make your laundry room pink, but I guess it’s the same with having a bathroom pink. 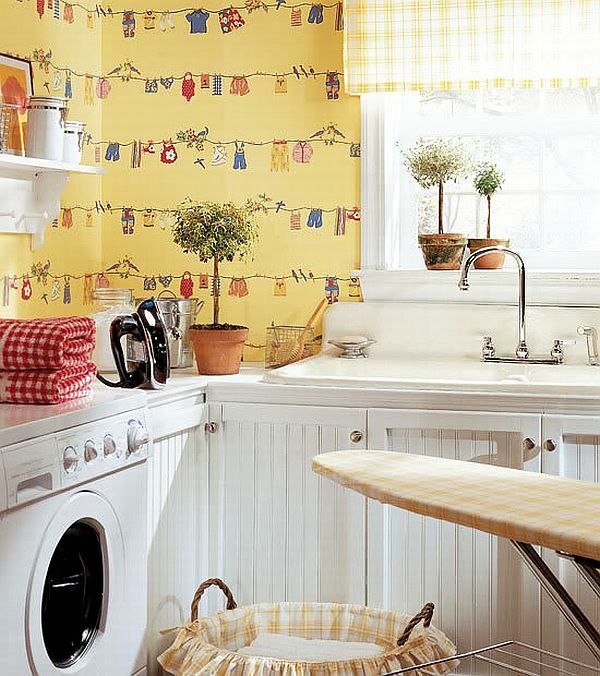 Thibaut is renowned for their wallpapers. This one is said to be named Laundrette. It comes in many colors and it’s nothing short of cute. White seems to go so well with purple and floral designs. Don’t you think? 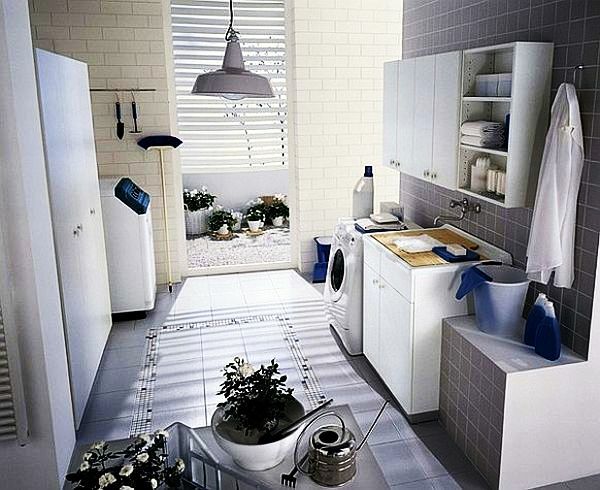 White walls, white furniture and a contrast — bubblicious blue tiles. 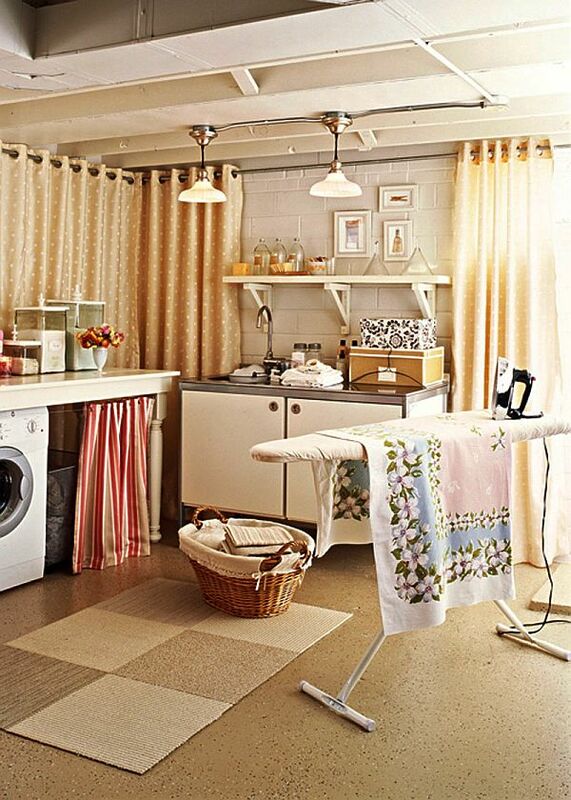 Totally awesome for a laundry room. Don’t you think? 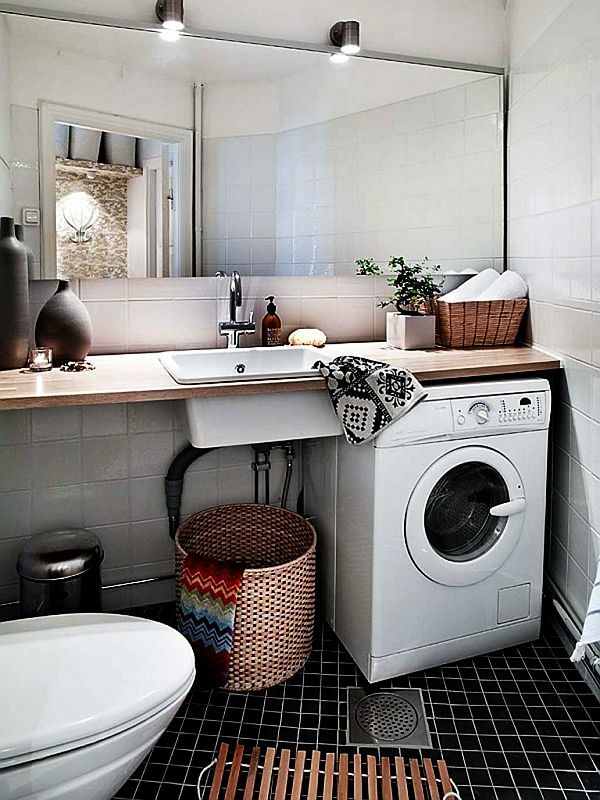 It’s not easy to fit in everything you need for a laundry room, when you only have a few square meters to deal with. 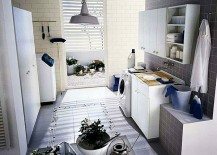 But it’s possible and all these images below should give you plenty of inspiration to do the same for your home.